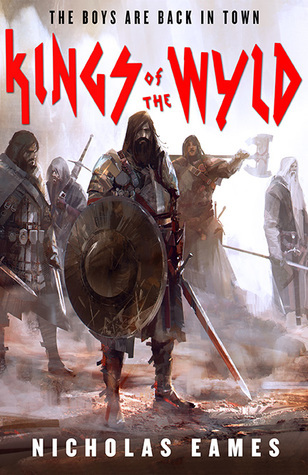 I won't go into any detail on why I love Kings of the Wyld so much, if you want to know why, you can click here for my full review of the book. However, right after finishing the book yesterday, I knew I just have to do this interview. So without further ado, here's my interview with Nicholas Eames on his main inspirations and writing process on his debut, book recommendations and when you can expect the second book in 'The Band' trilogy. Nick, thank you for doing this interview with me! First things first, tell us about yourself and how does it feel to finally publish a debut book? and a fantastic one as well! Firstly, thanks for saying so. Me? I love books and videogames. I’ve been reading fantasy since I was little and writing it (or trying to) for almost as long. Getting published was a dream come true, certainly, but the true reward has been seeing people react to the book the way I’ve reacted to my favourite books in the past—with excitement, and passion, and a desire to share it with others who may feel the same. The humor in this book is hilarious, I love how you were able to implement humor into a lot of serious scenes! oh wait the question, how did you come up with all these puns and jokes? Well, I make quite an effort to be funny in real life, so I suppose that managed to reach the page. To be honest, I didn’t always write this way. My first attempt at writing a book was serious and severe, but one day I decided to stop emulating the books I was reading and try writing in my own voice instead. This turned out to be a damned good idea, and boy do I wish I’d thought of it sooner. Who's the main inspiration behind the main characters of the book? They're diverse and highly lovable. I mean 30 pages into the book and I almost shed a tear already! I myself am pretty smitten with these characters. Clay and Moog, especially. They aren’t based off of anyone in particular, but I think what sets them apart from a lot of fantasy characters is that they are defined by what they love—not what they hate. The entire band, in fact, is bound together by something as simple as enduring friendship, and I think that bond is what makes them so appealing to me—and to readers, I hope. Their bond definitely appeals to me so I’ll say you’re successful on that front! I heard Guy Gavriel Kay is your main inspiration, I do however also notice the influence of Joe Abercrombie, Scott Lynch and Rothfuss in your prose. Is it safe to think of them as your main influences as well? Very safe! Although Guy Gavriel Kay influences my approach to writing prose, and Pat Rothfuss has inspired my love of truly genuine characters, both Scott Lynch and Joe Abercrombie sort of kicked open the door for infusing fantasy with a fair bit of humour. Admittedly, I took it a risky step farther, but I suspected there were readers like me out there who wouldn’t mind even more humour so long as it served the story. Bottom line: I love all those writers, and all of their books. Speaking of GGK, don't kill me but I haven't read any of his work yet, if you have to recommend only ONE book or series for everyone to read, will it be a book written by him? yes or no, please tell me the name of the book or series and why? I’d start with either Tigana, Under Heaven, or The Lions of Al-Rassan. Each one is a standalone novel, and each is beautiful and breathtaking in its way. Tigana, the most ‘fantastical’ of the three, is about a people stripped of their identity fighting to reclaim it. Under Heaven takes place in a ‘feudal China’ inspired setting and has a lot to say about friendship, and love, and the fickle nature of life in general. Lions takes place in a fantastical version of Moorish Spain, and has one of the most bittersweet endings of any book I’ve ever read. Once you’re into GGK, I’d suggest the Sarantine Mosiac—a duology. The second book in that series (Lord of Emperors) is hands-down my favourite book of all time. Thank you for the recommendation, I hope everyone (and me) will enjoy the books as much as you. Also, as a gamer I have to ask you this, one of my favorite part about your book is how I can envision them as something that were created out of a video game world, specifically Final Fantasy. I was pleasantly surprised to find a Portal, Skyships and Final Fantasy (Firaga, for example) references there! Is there any games in particular that became your inspirations in writing this book? I LOVE Final Fantasy, and if any part of my book evoked it then I’m thrilled to hear it. Yes, Firaga is a direct reference to the spell, and when an agent (who eventually refused the book) suggested that airships didn’t belong in a fantasy setting, it was my love of Final Fantasy that made me stick to my guns. In fact, I have a massive Yoshitaka Amano art book beside me right now, and will likely use it as inspiration when it comes to costuming the characters in book two. You have no idea how much your answer pleased me Nick. Speaking of art, Richard Anderson has always been one of my favorite book cover artist and I think he did a fantastic job with your book cover. Did both of you came up with the idea for the cover or was it completely his? All him. I, too, am a long-time fan. I played the heck out of Guild Wars (another game I drew inspiration from) which he did a lot of art for, and tended to buy any book bearing one of his covers. The day my editor told me he’d be doing my covers I was beside myself with glee, and almost every time I see the cover of my book I’m filled with awe, and disbelief, and giddy delight. I can’t wait to see what he does for the next two! It’ll probably be a year or so. I’m a fairly slow writer (as are most of my favourite writers) and although the harsh realities of today’s publishing world demand I put out another book fairly soon, my editor has been very patient with me this far. It’s more important to both of us to make something fantastic than to make something fast. It’s a daunting task for a second book to live up to a first that’s been so graciously received, but hey—it can’t hurt to try, right? Well said Nick, take your time and do your best. Thank you for doing this interview with me and good luck on your future endeavor, I'll be waiting eagerly! Thanks again for the questions, Petrik.